Adding luggage to your flight, especially two or more bags, can considerably increase the cost of your overall journey – even when flying with the lowest of low-cost airlines. Worse still is the fact that no two airlines have the same regulations, allowances, fees and excess baggage charges. Every single one is different – meaning that when it comes to booking a flight you’re forced to conduct hours of research just to find out how much stuff you can bring with you. Using a luggage shipping service is the best way to transport your baggage quickly and safely whilst also saving a significant amount on airline baggage charges. My Baggage is a leading luggage shipping company, transporting items to 200+ countries worldwide at a low cost. My Baggage offers you up to twice the weight allowance as most airlines, for half the price. You can send a 30kg suitcase, from as little as £16.99. You can book an unlimited amount of items. Fast delivery times of 1-2 days within UK and 2-3 days worldwide. 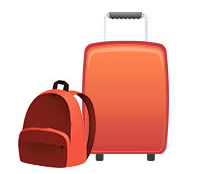 You can get a quote for your luggage shipment online any time.